On our second to last evening in Tenerife, we had dinner at Kabuki. 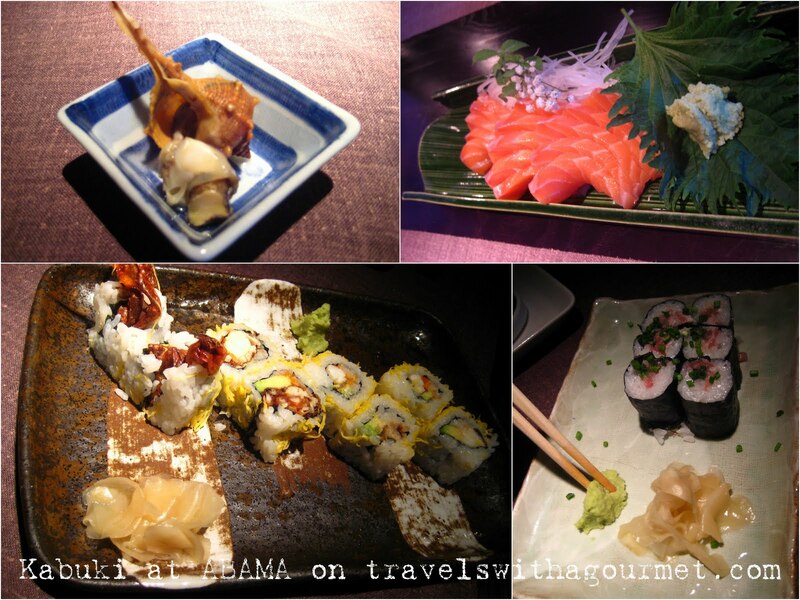 We had been to the original Kabuki in Madrid in the summer of 2007 and still haven’t forgotten the wonderful meal we had then that we were so looking forward to trying the one at Abama. The restaurant is located within the Citadel (main building of the hotel) and has modern interiors with black mosaic tiles and touches of red. Staff uniforms are in muted greys and on the table are a simple grey and white rectangular plate with a silver chopstick rest. We had a quick look at the menu just to see what interesting dishes they had – there was a chef’s tasting menu, sushi, sashimi, tataki and fish tartars, main courses and even a kid’s bento box menu. Our son happily coloured his paper place mat until the main courses arrived – from the kid’s menu, a bento box of tori karaage (deep-fried chicken pieces) served with rice and spinach – just the right size, it’s the yummier Japanese version of chicken nuggets. 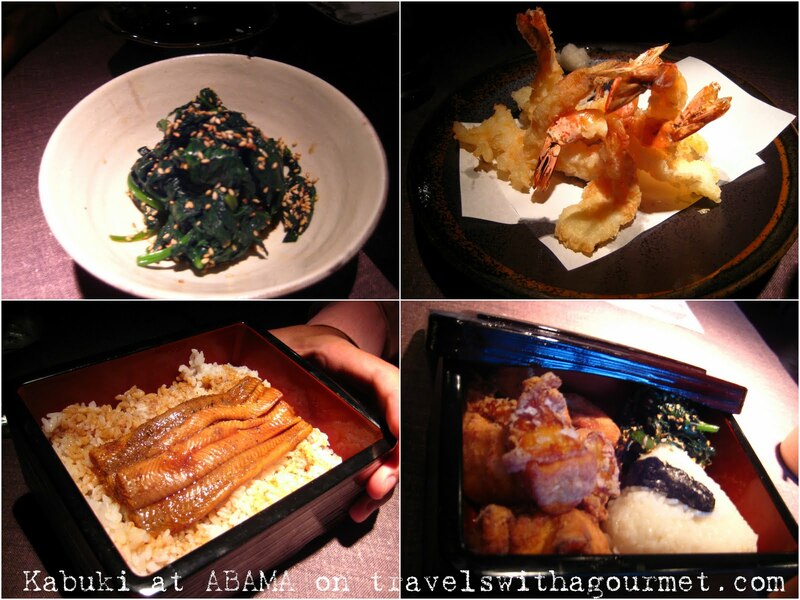 A had the unadon (grilled eel served over rice), I had the prawn tempura (deep-fried prawns) and we both shared a salad of cold cooked spinach with a soy sauce and sesame oil dressing. After our delicious dinner, A brought our son back to the room to get ready for bed. 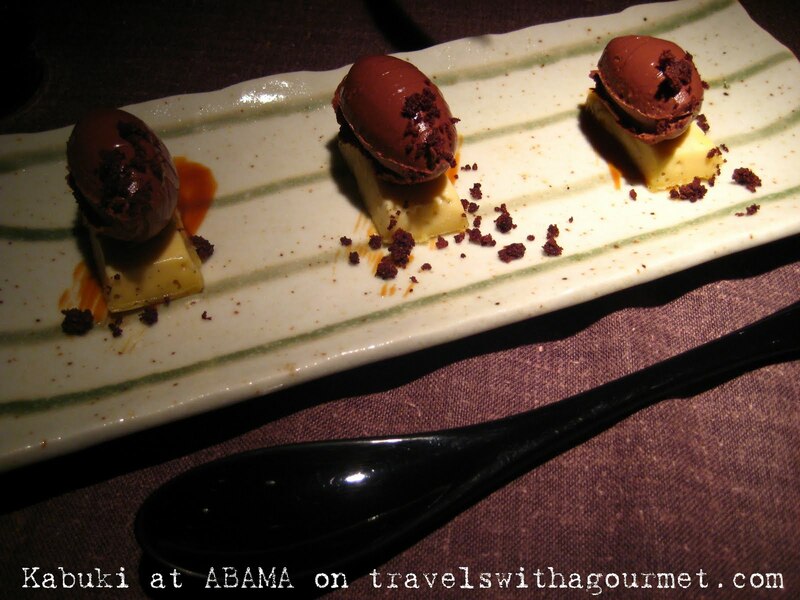 We ended our dinner shared one of the desserts especially created for Kabuki by famed Catalan chocolatier and patissier Oriol Balaguer – three quenelles of dark chocolate, over white chocolate jelly and caramel sauce topped by crunchy dark chocolate crumbs – a delicious end to a fantastic meal. Thanks for cheking in Mina. You're right, it was amazing! this all looks so amazing!